I've considered inflicting my thoughts about this on the web for some time, and now misfortune has given me the opportunity. 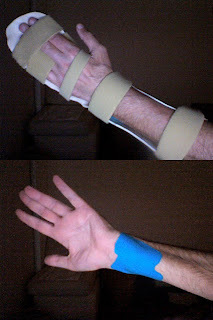 The day before the Super Bowl, I had a (non-cycling) accident, of which I'll spare all of us the details, but the result was a severe laceration of my left wrist. Now, after surgery, numerous doctor visits, and about 25 occupational therapy sessions I am just about ready to get back on my bike and return to commuting on it. However, until then, a bit about me and my commute. I've been a cycle commuter since 1985. Some periods more intensely than others, but about half the time since then I've lived without a car, so the idea of driving to work seems a little odd to me now. Until 2000, I rode to work every day, but then I moved up here to extreme North County, and so I started using the Coaster train to help cover the distance. Currently, my one way commute is 30 miles by bicycle, and at my best I make six of the ten one-way commutes by bike each week. The other commutes are a complex combination of bicycles, bike lockers, and trains. However, at this moment, I drive to my Coaster station, ride the train, then take a shuttle bus--one I often passed on my bike--to my final destination. From the train, I see my commute and all the other cyclists, so my determination to return to the status of rider is constantly fueled. When I return, I'll have to start small, but the final goal is the 60-mile round trip...a couple of times a week. The route I take is roughly an inverted L-shape, and base of the L is the hilly one-third from the home to the coast. The other two-thirds is along the coast on old highway 101, which I think of as "the show". The terrain is undemanding, but the road is busy with cars, pedestrians, tourists, girls in bikinis, surfers and their surfboards, and 50-something cyclists trying to live up to the pedigree of the bicycles that they're riding--all of which are a challenge to the cyclist who strives for efficiency. However, on my commute I've seen a lot of great sights, met a lot of great people, had some great conversations (with others or just with myself), and gotten a really good feel for the area where I live and work. I can't wait to get back to riding it, and I look forward to sharing my observations and memories with you. Until then, I'll be stretching tendons, training nerves, and practicing puncture repair in preparation. Happy Trails! Beautiful piece of open road! What great inspiration to heal and get back in the saddle!